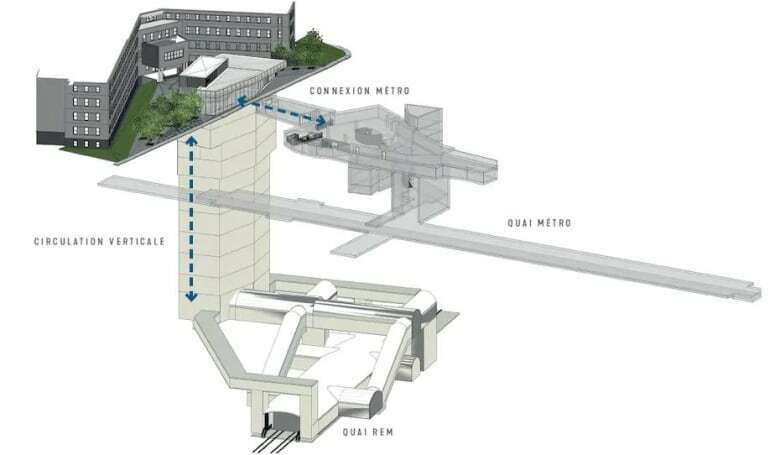 The Réseau express métropolitain (REM) station will connect to the Mount Royal tunnel, about 50 metres deeper than the city’s Metro line. Pedestrians will need to watch where they step near Université de Montréal's Marie-Victorin pavilion, as there's now a six-storey deep hole in the ground and it's getting deeper every day. No, it's not a wayward pothole. It's the site of the new light-rail train station slated to open by 2022, some 70 metres below the surface as the Édouard-Montpetit Metro station's downstairs neighbour. The Réseau express métropolitain (REM) station will connect to the Mount Royal tunnel, about 50 metres deeper than the city's Metro line. Blasting for the new station began in October after three months of preparation. But to cut so deeply into the bedrock just below a bustling city, crews have had to work in sections, carrying out targeted blasting operations in an effort to limit vibration damage to surrounding infrastructure and buildings. The consortium secures about 2,300 kilograms of rubber mats to the site of the blast to help muffle the noise of up to four detonations a day, but these efforts have not been enough for some residents and a nearby school. Complaints have been piling up. École Saint-Germain d'Outremont officials met with REM representatives at the end of February to discuss the situation and work was temporarily suspended until an agreement could be reached. 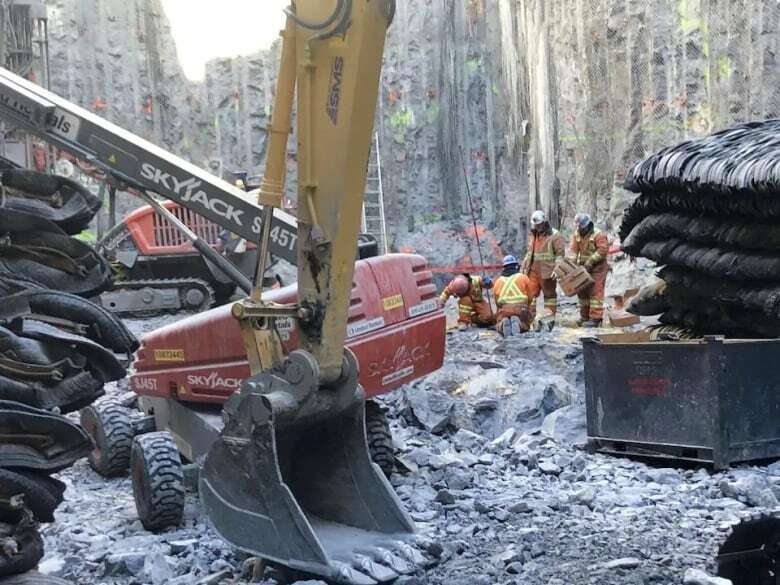 With new mitigation measures in place, blasts have since resumed as crews work to remove 30,000 cubic metres of rock, using baskets attached to cranes to haul the rock, mostly limestone, out of the hole and load it all onto trucks to be transported away. That limestone is an "extremely hard rock, which is very hard to break," said Thomas Fortin, who is managing the project for NouvLR, the consortium behind the project. Two teams of 30 workers keep the site operating from 6 a.m. to 11 p.m. every day. The aim is to have the excavation completed by the spring of 2020 so construction can begin. "It will then be time to fill the well with a station, adding all the architectural finish work, escalators and other elements," said Fortin. The station will be one of the deepest in North America, falling second to Portland, Oregon's Washington Park light-rail station which is 79 metres down. The Édouard-Montpetit REM station will allow passengers to travel from the Université de Montréal to downtown in just three minutes. It will be accessible by high-speed elevators that will carry an estimated 5,000 users per hour. "There are going to be big elevators that will be able to go down the equivalent of 20 floors in about 20 seconds," said Fortin. "From there, when users exit the elevators, they will end up in a station that will look like an STM station." The station will be one of 26 stations on the new 67-kilometre network. 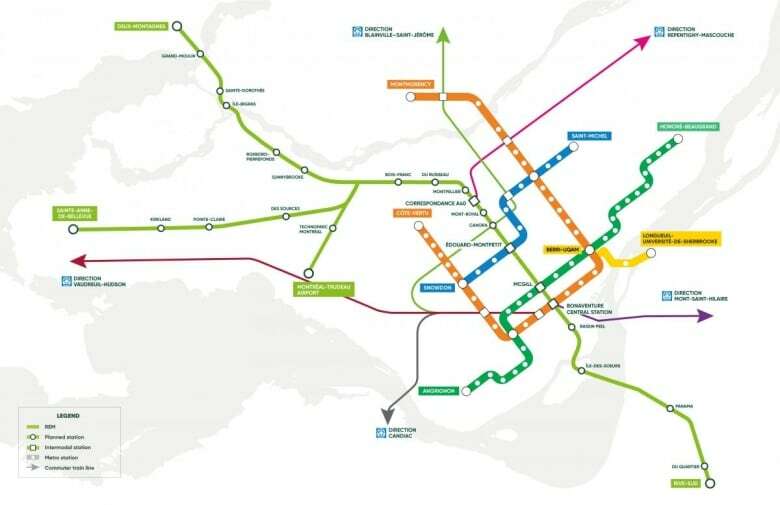 Those stations will be in places like downtown, Brossard, the West Island, Laval and at Pierre Elliot Trudeau Airport. The $6.3-billion network is funded largely by the provincial and federal governments and its construction is being managed by CDPQ Infra, a subsidiary of the Caisse de dépôt et placement du Québec. The consortium building the project includes firms SNC-Lavalin, Pomerleau, Dragados Canada, Aecon and EBC, but the trains will be manufactured in India by the consortium of Alstom Transport Canada and SNC-Lavalin.